Found one file extension association related to NIS-Elements and 1 file format developed specifically for use with NIS-Elements. 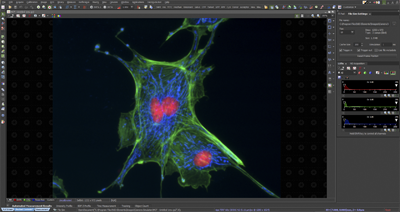 NIS-Elements was developed by Nikon for the most advanced levels of research—giving the user complete control of all microscope and camera functions. The software is geared to deliver power and maximize workflow. It handles multi-dimensional imaging flawlessly, with support for capture, display, peripheral device control, and data management and analysis of up to six dimensions (X,Y,Z, Lambda (wavelength), T, multipoint). It also offers sophisticated image processing features, such as an extremely powerful deconvolution module, exclusive one-click database capability, and Extended Depth of Focus function. If you need more information please contact the developers of NIS-Elements (Nikon Corporation), or check out their product website.